Photo: Cape Cod Hospital, courtesy of KI. 1. Widow treatments wide enough to not block ANY natural light or view. 2. Patient positioned in a way that they have the option on the best view outside. In new construction, encourage the arch to not have the window and head wall on perpendicular BUT opposite ends of the room. 3. 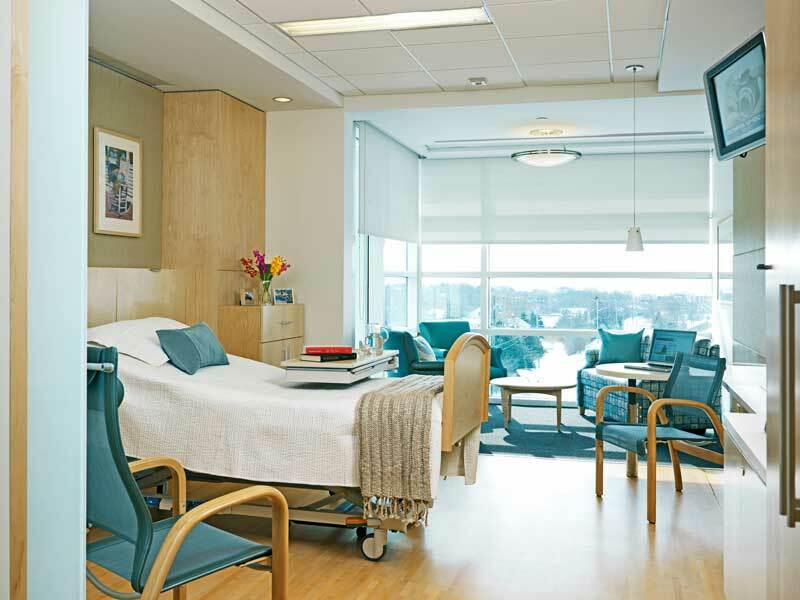 Hallways (where patients will be transported on their backs, looking straight up) should have ONLY indirect lighting – so they don’t have lights shining directly in their eyes AND a view of dirt and dead bugs in the light fixtures. 4. Better job of concealing TV mounts and wiring. Maybe position TV’s over the doorways into the rooms? 5. Best practices for concealing ALL cords & tubing and surplus med supplies. Thanks, Sandy. These aren’t all product ideas, but they are good design suggestions!